A Mexico City BBQ Restaurant Is Hiring Trump’s Deportees“That’s our government. I feel responsible for it,” says Pinche Gringo’s expat owner. Here’s the Barbecue Tweet That Broke TwitterNever tell people in the South that the best barbecue is in Brooklyn. Franklin Barbecue, America’s Best Smokehouse, Has Closed After Catching FireNobody was hurt, but the owner says he isn’t sure when they’ll reopen. Barbecue Meets Fine Dining at Pig Bleecker, Opening This WeekEven the salt is smoked. Craziest Facts About Franklin Barbecue’s LineNot even Kanye gets to cut. Texas Restaurant Offers Massive Discount to Customers Carrying GunsWhat could go wrong? Barbecue Experts Blast Fox News’ ‘Racist’ List of InfluentialNo African-American pitmaster, not even Ed Mitchell, was deemed worthy. Two All-Star Barbecue Teams Are Teaming Up for a New Concept in GowanusPig Beach opens for the summer season on Wednesday. Brisket Is More Expensive Than Ever BeforeAnd prices aren’t coming down for three or four years. President Obama Continues His Tour of America’s Best Barbecue JointsHe also had a Bud Light. A Private Grill: The Ultimate Manhattan Apartment LuxuryBut is it even legal? Dinosaur Bar-B-Que Expands to ChicagoThe upstate New York-based chain will open on West Weed Street next year. 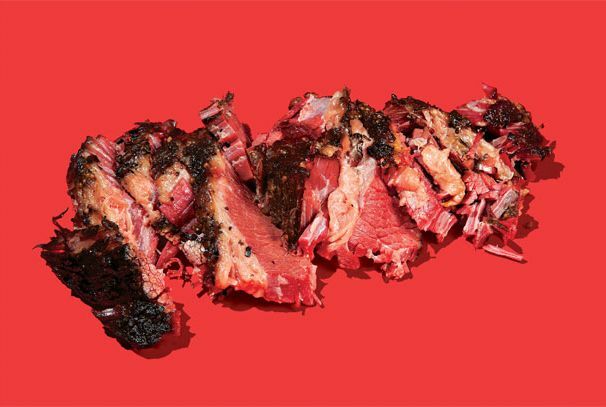 Mighty Quinn’s Is Indeed Opening a West Village LocationMore brisket is on its way. Whole-Hog Barbecue and Beer Hall Opening in East Williamsburg5,000 square feet of North Carolina flavor is coming to Brooklyn. 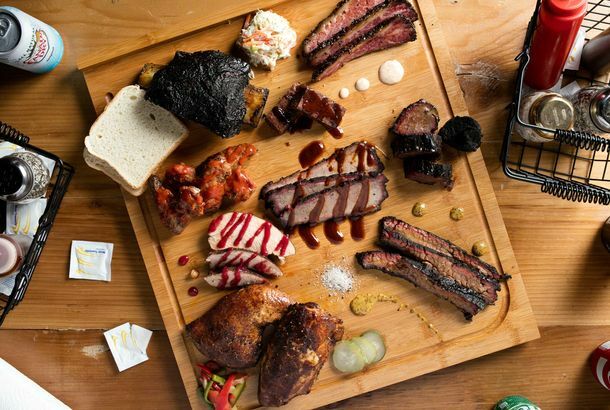 Mighty Quinn’s Eyeing West Village LocationGood-bye, baby back ribs; hello there brisket. BBQ-Scented Heroin Leads Police to Restaurant Owner’s DoorAnd he would have gotten away with it, if it weren’t for that pesky slow-cooked smell. What to Eat at Route 66 Smokehouse, Opening This Week in the Financial District100 percent all-American is the theme of this new bi-level barbecue joint. Pride and Joy BBQ Inches Closer to Opening, But Without Myron MixonA lawsuit and the departure of pitmaster Myron Mixon have delayed the restaurant’s opening. Morgan’s Brooklyn Barbecue Scores a Liquor LicenseWhiskey and smoked meat, together at last. Hometown Barbecue and Morgans Barbecue Open in BrooklynBrooklyn just got a little bit smokier. Pitmaster Josh Bowen’s Alchemy, Texas Closed in QueensThe ‘cue may reappear somewhere else. Myron Mixon’s Pride & Joy May Not Open in the East Village After AllThe old Lucky Cheng’s space may not get a new restaurant anytime soon. 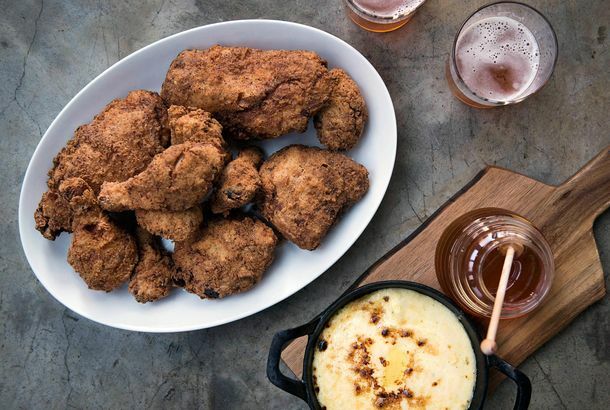 Slideshow: Barbecue With a New York AccentSmoked-meat specialties that represent the new wave of New York barbecue joints. Go Pro: 21 Next-Level Grilling NecessitiesIt’s time to step up your barbecuing game. Dinosaur Bar-B-Que Opens in Brooklyn TonightHells yes. We’re Giving Away Five Tickets to the Saveur BarbecueCan you smell what the awesome and elegant food magazine is cooking? Austin’s Franklin Barbecue Pops Up in New York; Mighty Quinn’sSmoke gets in your eyes. Bludso’s Open On Memorial DayThe restaurant is offering to-go orders of most of its meats and all of its sides. Fatty Cue’s Robbie Richter Previewing Roadhouse L.A., Next Week In HollywoodDishes include Jamaican jerk cupcake chicken and “Tejas” tempura sausage. What You Missed At The West Coast BBQ ClassicBarbecue was taken seriously in Long Beach this past weekend. Very seriously. Here’s the Pitmaster Lineup for June’s Eleventh Annual Big AppleIt’s going to be smokin’. Umami Broadening Barbecue at Roadhouse L.A., Opening This Summer in WestMenus may include whole heads and shoulders and international influences like in a Punjabi poutine. Michael White’s Cooking at Hill CountrySave the date: March 10. Did the Smoke Truck Get Snuffed Out?The truck’s been idle, and sitting on three flat tires for months.